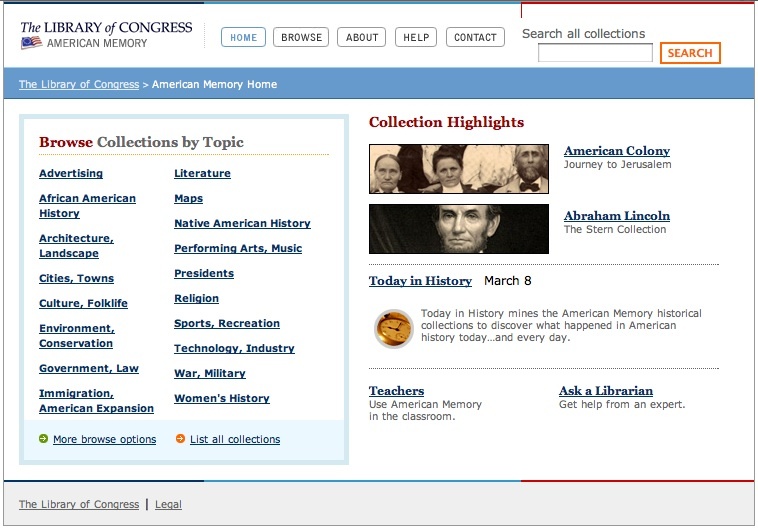 The American Memory Project is a website promoted by the Library of the Congress, sponsored by the Congress since 1990. It is a History educational aid project, aiming at digitizing audio, video, photographic and textual materials of the Library of the Congress’s collections, in order to make them available online to the public. It contains more than 100 collections with more than 5 millions multimedia items, some of them dating back to the XVIII century. Available data include old maps, presidential speeches, collections of letters, movies and photos, music papers, etc. Materials are organized by general topics such as Art, Literature, Law, or Science containing several collections, each with detailed information about its content. Files are downloadable in many formats. Information is easily retrievable thanks to sophisticated, as well as easily usable, search engines. Access, search and download are completely free, neither subscription nor membership is required. The project offers plenty of useful materials on American History and shows an excellent web architecture.